Some of you would have heard by now this news. Due to popular demand, never before in the 3P short history, the ride has sold out. I understand they have accepted over 1,700 entries. Sweet, but, you guessed it, this little black duck hadn’t booked. In fact, our little group of 8, of which there are 5 riders, only 2 had booked before the premature closure. So we are desperately seeking tickets from cancellations. So if you know anyone who can helps us, can you please forward my details to them. In fact, can you please pass this request onto anyone who you think may help, post it on your local cafe notice board, anything, please. Regardless, we will still be travelling, accommodation is all booked, so it may just turn out to be a weekend away with some riding around the mountains at our leisure. Regardless, training for 3Peaks has hit it’s stride, but the heat is certainly curtailing some of our rides. Last Saturday we were up and out by 6am for a 100+km ride with 2,100m altitude gain. It t was meant to be longer, but the heat beat us. 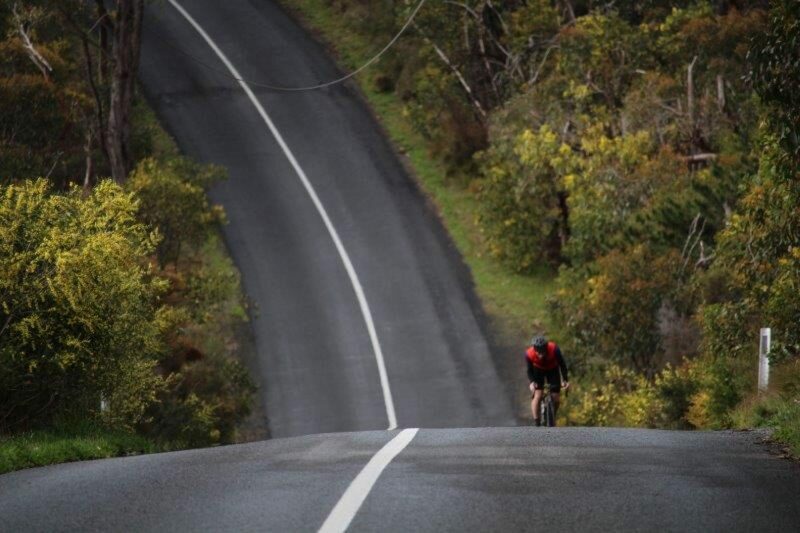 With the course being 235km with 4,300m altitude gain, we need to ramp up the climbs over the next few weeks. The route we did travel was however superb. There were even some roads up around Birdwood that I haven’t ridden before, bonus. Have a gander here. (Oh yeah, these are all grabbed from VeloViewer. I must say that veloviewer is becoming very popular in the wedlegs home). Training is coming along well, although I haven’t been able to get the longer rides in. The below log shows blue for 2014, grey was 2013, and orange was the training for the last 3P, although I didn’t start logging on Strava till early Feb.
Last week saw Adelaide host the National Track championship. Videos of the Nationals can be seen here. Some other photos from the tracks. Caffeine has been shown to improve muscle strength and endurance, which is why you see runners(substitute riders) downing coffee before a race. You’ll see this benefit by consuming low-to-moderate doses of caffeine—considered 3 to 6 mg per kg of body weight—15 minutes to one hour prior to exercise, according to a review paper in the Journal of the International Society of Sports Nutrition. If you’re a 170-pound (77 kg) guy, that’s between 213 and 463 mg of caffeine. Espresso coffee is typically made from 7 grams of finely ground coffee extracted to 44 mls over about 25 seconds. The USDA value for Espresso coffee is 64 mg caffeine per 30ml. If my maths serves me right, at around 80kg, I would need to consume around 230mg of caffeine, or just a tad fewer than Dos Espresso Doppio before my morning rides to get the benefits the study was talking about. Not sure that would be good for me in the long run. I posted a few comments 2 weeks ago some comments about the Bianchi I borrowed overnight from the Tour Village. I borrowed a second bike (overnight again) the next day, the Focus Izalco Max 3.0 MD. The Izalco Max is a frisky stallion when compared to the Bianchi Infinito CV which isn’t surprising given the Izalco is designed a a thoroughbred racing bike and the Bianchi is more of a forgiving tourer. As for the Bianchi, the test ride took me up Greenhill and over to the lookout, then back across to Norton and down Norton Summit Road. A decent climb, twisting sweeping bends across the top with space to open up and some heavy surfaces on the ride back down, giving a good mix of road surfaces to give the beast a good workout. My impressions. Yes it is very light, but I found it to be significantly stiffer than my current road bike and the Bianchi, culminating in a bike that to me was quite frisky. Very responsive verging on the twitchy on the descent, not helped by the heavy roads with minor undulations providing feedback up through the front forks. It was a pleasure to ride a stallion like this, making the hand back to the Focus guys at the village and picking up my old bike very difficult. It looks good outside Argo. However, for this old body, I’m probably many years too old for the focus, don’t deserve a bike like this and am more suited to a more forgiving bike. I wouldn’t knock it back though! Those local Adelaidians would have seen the havoc the wild winds wreaked around Adelaide, particularly in Burnside at the base of the foothills. Trees and boughs bringing powerlines down. My morning ride this morning was disrupted because of a tree blocking Sunnyside just on the upside of the hairpin. The area around Stoneyfell looked like a war zone, 24 hours after the event.